LIMA — Gas prices have recently dropped due to lower oil prices, but prices are subject to change within the next few weeks, said Patrick DeHaan, head of petroleum analysis for GasBuddy. As of Monday afternoon, Shelby County had the lowest gas prices in the Lima area at $2.56, 25 cents lower than the national average. 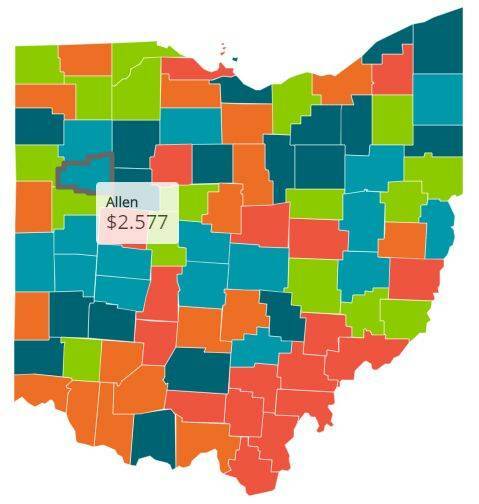 The county with the second lowest average gas price is Allen County at $2.577, followed by Putnam County at $2.62, Hardin County at $2.631, Hancock County at $2.639, Van Wert County at $2.67, Auglaize County at $2.70, Mercer County at $2.76 and Logan County at $2.76. On Monday afternoon, the average price for a gallon of regular gas in Ohio was $2.66, which was 13.5 cents less than last week’s average. Sunday’s gas prices were 2.5 cents more than Monday’s average. Last month’s gas prices were 12.6 cents more than this month’s. Gas prices are 27 cents higher than this time last year. Gas prices in the Lima region have gone down 3.3 cents since last week, according to prices reported to GasBuddy.com. Sunday’s gas prices were 18 cents lower than Monday’s prices. Regional gas prices are 7.9 cents lower than last month and 34.8 cents higher than last year, according to GasBuddy’s daily survey of 5,345 gas outlets in Ohio. The national average was 2.6 cents lower than last week’s average at $2.92. Sunday’s gas prices were consistent with Monday’s prices. and last month’s gas prices were 2.6 cents lower than this month’s. However, gas prices have gone up 42.5 cents since last year. Despite the lower prices in the Great Lakes states, average prices on the West Coast have gone up due to a gas pipeline explosion last week. DeHaan also believes that the West’s claim that Saudi Arabia is behind the disappearance of a Washington Post journalist could cause tensions.